Lately, I’ve been asked to share. It’s not an altogether unusual request, as I’ve often shared of how Beaucoup came to be, or even of my cherished time in France. But these recent requests are different; they are for hidden memories, closer, if even possible. Not closer because they are more valued, but simply because there were shades in each story, I hadn’t yet understood, so I guarded them, untouched. And so it goes that something grows in privacy from the simple act of being unspoken in the passing of time. Like gravity or the revolving earth, days in and nights out, the longer a memory is silent, the closer it is to the shelf we place those funny dreams we have, without relevance or reason to recount. It was four years ago, shortly after moving to Paris, my former husband and I decided to take a detour to visit his sister in the DRC. She worked as a Gorilla conservationist and it was an opportunity to see a world that was so extremely foreign to me, even more so at the time, since I had traveled very little. I had always had a faint dream of seeing the world, but life settled in, solid like a thick, stone wall, inhabiting its place and seemingly unmovable. I also have come to see that it’s hard to want something desperately enough when you can’t even put into words the exact thing you desire. So the wall remained unmoved until, by fate, I began to move. We landed in Rwanda. I remember thinking that not only did the language have a different sound, but even beauty was spoken differently. Bright neons and primary colours wrapped around bodies and into fabric sculptures adorning the crowns of majestic women. I studied their yellow tulip-shaped skirts hugging their plump and sturdy hips while they swayed with rhythmic ease down dirt roads. A car waited for us with his sister and her Congolese boyfriend inside, ready to drive us to the border into the DRC. I quickly discovered that the immigration system consisted of slipping bills into hidden hands, and so we crossed over. I remember the ground was like a rapid, black river frozen in time. A volcano had recently erupted leaving the roads tumultuous, but no one really noticed or cared much about things that might put an average North American into a terrifying crisis. I secretly wondered if people prioritized when there was too much to worry for, or if it all became numb. We spent a few days watching life: eating local fruits, going to the dressmaker, socializing with UN aid workers in their “off time”, drinking beer at Congolese clubs, and hopping onto the backs of “moto-taxis” zipping from one local joint to the next. Sitting in the back of open NGO trucks, children would put out their hands asking for candy and I would catch glimpses of a life so far from my own story, but passing by too fast to catch the whole narrative. 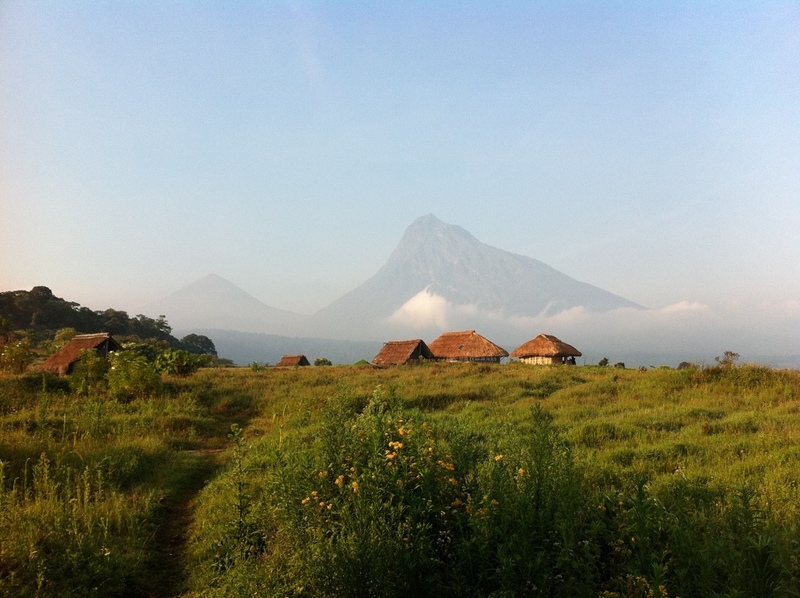 We traversed the country towards the Virunga mountains in search of gorillas. On the morning we planned to hike, I awoke in my small hut, zipped cozily into my sleeping bag. Showers or baths were scarce, and when there was water, it was shared amongst many. We took “just enough”, and I knew I had been too greedy if my bathwater ever looked clear by the end of my duties. I never told anyone that I relished in the strange liberation from hygiene…quite literally a dirty, little secret. 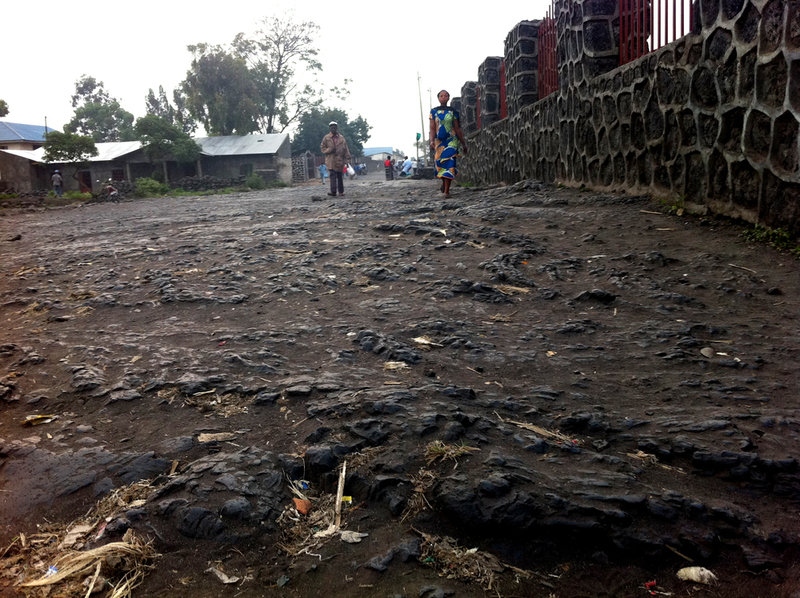 In the white morning light, we walked through tuber fields, heading for the base of the Virunga. The eight-hour hike was spent tracking a trail of broken branches and footprints, through fire ant nests, sticky, black sap and thick, heavy brush cleared just enough so we could pass. After six hours, we came to a small clearing and there, sitting 15 feet away, was an animal so wild and strong, my frailty and reason became heightened in contrast. There was no preparation needed for this encounter, the only rule given was “If they charge, don’t run or they think you have a reason to run.” So we were told to stay calmly still if in the incident 400lbs of dense muscle approached us. No preparation needed. I stood, unmoving regardless of attack, senses engaged. 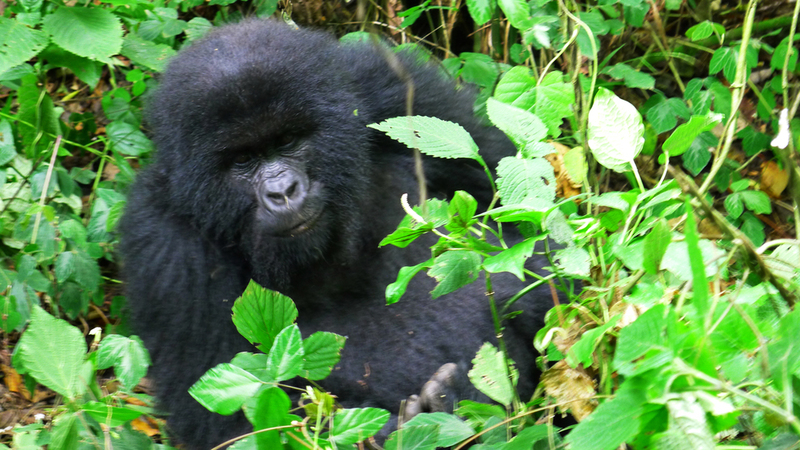 I took a quiet breath in and remember being amazed at how gorillas smelled like humans, but stronger and more pungent. We watched intently like awkward houseguests, a baby playing, a father asserting, others chewing lazily. After what seemed like a long while, we turned to leave and descended quickly back through the tuber fields at dusk. Excited exchanges bubbled about the experience. In my broken French, a word I fought hard to learn, fell fluidly from my lips and I felt a shift in the way the language lived in my mind. This morning I went back to look through the photos and vague, disparate moments filled in and connected to become memories, like melodies forming a song. I noted stories I skipped and danced around, like they way some do when speaking of passed companions. And I began to wonder why I was safekeeping this tune at all.